3 publications with the keyword "bioinformatics"
K. Palaniappan, T. S. Huang, and H. Lee. Automated reading of DNA autoradiogram images using lane profiling methods. IEEE Int. 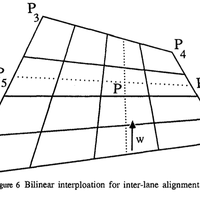 Workshop on Industrial Applications of Machine Intelligence and Vision, pages 360--367, 1989. There is a great deal of interest in automating the process of DNA (deoxyribonucleic acid) sequencing to support the analysis of genomic DNA such as the Human and Mouse Genome projects. In one class of gel-based sequencing protocols autoradiograph images are generated in the final step and usually require manual interpretation to reconstruct the DNA sequence represented by the image. The need to handle a large volume of sequence information necessitates automation of the manual autoradiograph reading step through image analysis in order to reduce the length of time required to obtain sequence data and reduce transcription errors. Various adaptive image enhancement, segmentation and alignment methods were applied to autoradiograph images. The methods are adaptive to the local characteristics of the image such as noise, background signal, or presence of edges. Once the two-dimensional data is converted to a set of aligned one-dimensional profiles waveform analysis is used to determine the location of each band which represents one nucleotide in the sequence. Different classification strategies including a rule-based approach are investigated to map the profile signals, augmented with the original two-dimensional image data as necessary, to textual DNA sequence information. K. Palaniappan and T. S. Huang. Image analysis for DNA sequencing. 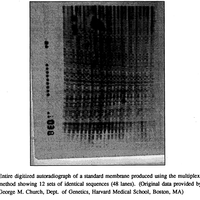 SPIE Proceedings on Biomedical Image Processing II, volume 1450, pages 186--197, 1989.